O Athletik offers several resources to help you reach your sports performance training objectives. Our facility is built to help you monitor your success, as well as create an environment of friendly competition with friends and co-athletes alike. Whatever sport you are training for, we provide you with the equipment to reach your goals. Ladder drills are the perfect training exercise for a sport like soccer, as this builds lower body coordination and detailed footwork essential for dribbling a soccer ball across the field. A special class we offer that features ladder drills, cone sprints, and more is our “O”gility class that specializes in agility and speed training. 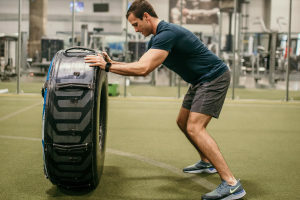 Any sport like football, rugby, or basketball that focuses on upper body strength as well as your posterior-chain muscles will benefit from this popular exercise. Our indoor sports performance training field is spacious and temperature controlled, so no matter if the field outside gets wet and muddy, your training can continue at our facility. Work your chest, shoulders, and triceps with shoulder weights at our facility. You can implement shoulder weights into your other exercises, such as squats and lunges, to get a full body workout. Your body will be toned in no time and ready for the backstroke and breaststroke. Our facility also accommodates an endless pool, featuring underwater treadmills and a current that encourages you to keep on swimming. This pool is great for low-impact exercise for those in recovery, or for training triathletes. This exercise is great for track and field athletes, and box jumping is essential for those who participate in the long jump and hurdling divisions especially. With this exercise, you can build both upper and lower body strength while conditioning your body to jump to heights quickly and efficiently. 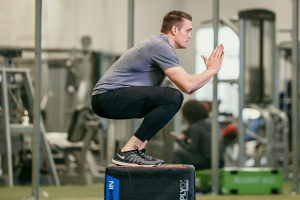 While squats are great for for your core and lower body, box jumps familiarize your body with the motion of jumping and promotes muscle elasticity. O Athletik offers an array of classes that promote sports training and conditioning, from our “O”gility classes to our Alpha Strong classes. After an intense workout, don’t forget to stop by our Athletik Restore class to soothe your muscles and relax your heart rate. To learn more about what we have to offer, check out our class schedule and pick a time and class that works best for you.